Two weeks after the primary election, a race in Elbert County remains too close to officially call. ELBERT COUNTY, Colo. — Two weeks after the primary election, a race in Elbert County remains too close to officially call. Republicans Rick Pettitt and Anthony Hartsook are separated by one vote for County Commissioner District Two. Pettitt has 2,994 votes as of Tuesday, Hartsook's has 2,993, respectively. There are 10,134 active Republicans registered to vote in Elbert County. About 50 percent -- 5,136 -- voted in the primary. There is no Democratic candidate for County Commissioner District Two, so the primary was the only chance to have a voice in this race. Elbert County Clerk and Recorder Dallas Schroeder is now planning on a recount, which is scheduled for Wednesday, July 18. "Sitting and waiting and just seeing what the results are is kind of sitting on pins and needles, but it's exciting nonetheless," said Hartsook. Schroeder and his team will re-run every ballot they have, repeating the same scanning process to double-check the votes. "You keep thinking about things, how close it could be, what's going to happen in the recount, if it's going to come out the same. Makes you a little anxious," said Pettitt. "It's just an example of why every vote counts." While the candidates wait to find out if the difference between them is really just one vote, the conversation may be bigger than whether every vote counts - the question could be whether every vote they have was cast correctly. Between active Republican voters and unaffiliated voters that turned in a Republican ballot, Elbert County received 6,472 Republican ballots. Of those, more than 7 percent of them did not have a vote for county commissioner. "We had a total of 485 Republican ballots that were turned in that did not have a mark for either commissioner candidate in the race," said Schroeder. "Clerks across the state get frustrated when we see these undervotes, especially in a close race like ours that can make the difference." 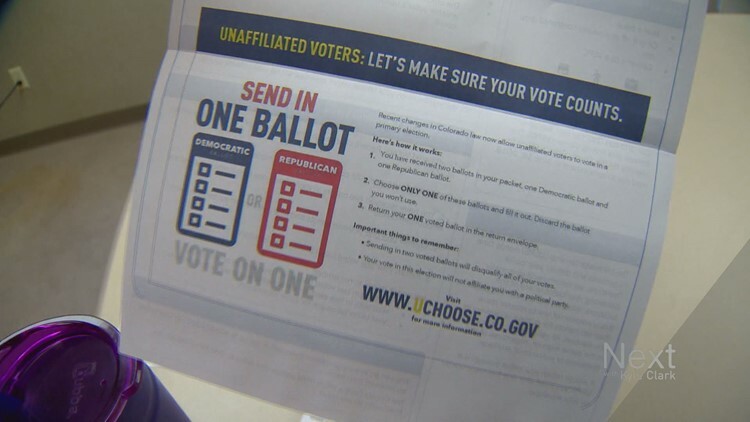 24 - unaffiliated voters: These voters returned both Democrat and Republican ballots, which is not allowed, so neither counted (despite multiple warnings from Next). 18 - signature discrepancy: These have been turned over to the district attorney's office to investigate for potential voter fraud. 12 - ballot turned in too late: These were received after the deadline, 7 p.m. on June 26. 9 - no signature: They were sent letters letting them know they could come in and cure their ballot. 1 - canceled voter: This person received a ballot, then unregistered, and still turned in the ballot anyway. It was flagged by the computer system. "People have the opportunity to vote and they should take advantage of that, but there's also a responsibility on their side to learn what they have to do to make sure their vote counts," said Schroeder. Hartsook said he even has unaffiliated friends who didn't vote for him because they didn't understand the rules. "Are they still your friends?" Next asked. When the first results were released at 7:15 p.m. on election night, Pettitt held a 24-vote lead. "I knew it was going to be close, I didn't know it was going to be that close," said Pettitt. Since then, his lead shrunk. "Sixteen, then eight and now one," said Hartsook. "Usually, the margins are big enough that nobody understands what happens after 7 p.m. on Election night. They get that first upload, 'Oh, so-and-so won,' and that's the end of it. But for us, it's halfway through the election because there's still a lot of things that have to happen before we certify the election," said Schroeder. Part of the reason it continued to shrink over time is because Elbert County had to wait to receive ballots that were turned into other counties. "The way the law is written, it's not just get your ballot to your county clerk, it's get your ballot back to a county clerk," said Schroeder. "We received ballots from El Paso, from Douglas, from Arapahoe, from Jefferson and Denver (Counties). (Denver) had roughly 175 more ballots for us to tabulate, so we ended up with around 250 ballots that needed to be tabulated and we did that last Thursday." For now, the candidates will continue to wait for at least another week, and contemplate what kind of loss would be more tolerable. "It's a lot easier on you as an individual if you win by a landslide and not by one vote because you sit there and wonder what's going to happen on the next step," said Pettitt. "If you lose the Super Bowl by one point or you lose it by 50, a loss is a loss," said Hartsook. If the recount comes back with a different total than they currently have, process starts all over again. "We'll have an interesting time, then. More likely, we'll recount again," said Schroeder.